The onboarding process is one of the first things a new employee experiences with your company so make it easier and more welcoming with HRSoftware.me. It’s vital that all on-boarding steps and paperwork are handled and delegated in a timely manner. 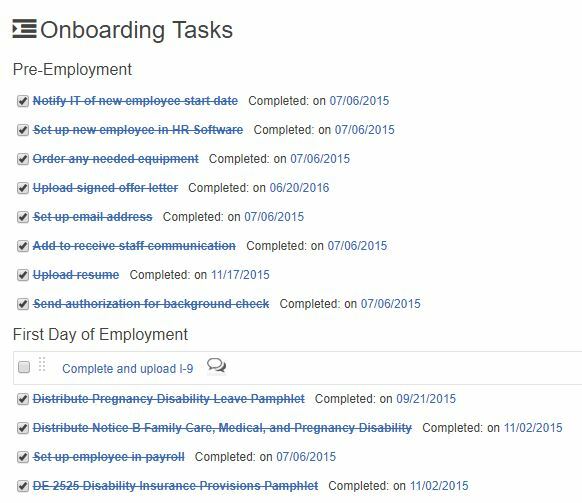 Whether it’s pre-employment or the employee’s first day, HRSoftware.me is the answer. Onboarding templates that allow you to easily add a multitude of steps (tasks) at once from your pre-configured list of items including forms that need to be signed make it simple. And with HRSoftware.me’s built in E-Signature system employees will be able to handle these items quickly and efficiently. It’s just as easy to track what’s been done, what hasn’t and who it was assigned to. A simple check-list shows all this and more. And in case you want to follow up, have a question about a specific onboarding task or want to add an attachment, using the comments section gives you those features with a complete history. With HRSoftware.me there’s really no reason to let anything slip between the cracks again!